Our tax laws force off-shoring. You can manufacture a computer in Chicago, which requires an average corporate income tax of 27%. Exporting that computer to China, when it reaches Hong Kong, China adds another 17% value added tax. But if you manufacture a computer in China, the 17% VAT is rebated or cancelled as it leaves Hong Kong for Chicago. And when it reaches Chicago, there is no 27% add-on, making for a 44% penalty to produce in Chicago. Imagine a country where you can’t produce for a profit. Well, that’s Obama’s United States today. Hollings is the last person you would expect to find online, but his blog is terrific. 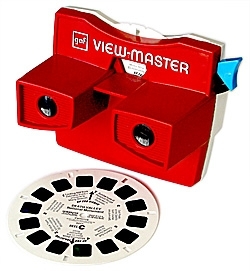 On a sad note, Mattel/Fisher-Price has announced the permanent closing of the Custom/Commercial/Scenic View-Master division of View-Master. Scenic reels and the Classic Model L will cease to exist. All of the special special 3 Reel sets such as Old TIme Cars, and the on-location ones such as Grand Canyon will no longer be produced. No more commercial Reels either. The economic downturn and Mattel/Fisher-Price’s association with China has claimed another victim. And even though, at least, executive salaries and bonuses will be saved by pending layoffs in excess of a thousand U.S. workers, an era that lasted almost seven decades comes to an end. Children’s titles produced with Wal-Mart’s approval are planned to be continued for the present. What’s to be done? I don’t know. It sounds like a done deal. Stereoscopy in general and Viewmaster in particular have a great deal to offer adults. To peer into the viewer and tease out 3D effects is a meditative exercise. Not only is it an extremely relaxing use of a few minutes, it also trains the eye to take a more attentive look at the world. Trade with China, disparity between workers’ wages and executive compensation, the recession, the power of Walmart, etc, all play into the decline of the medium, but the root cause is something deeper. The people in charge of corporations like Mattel just don’t believe that American adults are interested in sitting still and using their minds. They may be right. But if they are, it becomes a vicious circle. Loud entertainment systems that allow their users to be passive sell quite well, so capital devotes all its resources to promoting loud entertainment systems that allow their users to be passive. After a while, we as a society forget the use of quietness, the value of stillness, the importance of simplicity.